Undulating sun-kissed hills planted with rows of lush vines yielding fruit that has the potential to make us merry; the prospect of owning a vineyard is universally romantic to those with an epicurean edge and an appreciation for the finer things in life. “There are many reasons to buy a vineyard,” says David Ashcraft, founder of Vintroux Real Estate, who has been selling vineyards in Napa Valley and Sonoma for 17 years. “They are usually in beautiful locations, and they epitomise a great lifestyle, something that they can share with friends and go and visit. Plus, there is huge bragging potential. On top of the property itself, you can create your own wine that you can gift to friends and associates and that can also be run as a business and yield some income.” You need never worry about buying the best wine for your superyacht parties again. Undulating sun-kissed hills planted with rows of lush vines yielding fruit that has the potential to make us merry; the prospect of owning a vineyard is universally romantic to those with an epicurean edge and an appreciation for the finer things in life. “There are many reasons to buy a vineyard,” says David Ashcraft, founder of Vintroux Real Estate, who has been selling vineyards in Napa Valley and Sonoma for 17 years. “They are usually in beautiful locations, and they epitomise a great lifestyle, something that they can share with friends and go and visit. Plus, there is huge bragging potential. On top of the property itself, you can create your own wine that you can gift to friends and associates and that can also be run as a business and yield some income.” You need never worry about buying the best wine for your superyacht parties again. You can plant grapevines wherever the sun shines, but when it comes to investing, some locations are better than others so check out some of the best places for wine tasting before you buy. 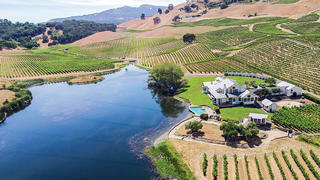 Take, for example, this 109-acre estate with a 5,000-square-foot main house, a 1,500-square-foot guesthouse, two barns and 35 acres planted with Merlot and Cabernet Sauvignon. 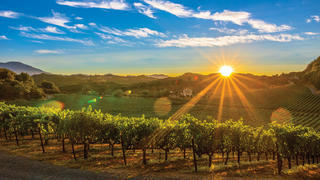 The vineyard is located in the Napa Valley Appellation. The unique microclimate provides very desirable fruit characteristics, and wines made from this vineyard have received numerous awards and accolades. "We were searching for a country home; I was between Miami and New York and Steph was in San Francisco," says Dennis O'Neil, co-owner of the Checkerboard estate in Napa Valley (pictured). "We were looking for something in wine country in the Napa Valley area and we came across the initial part of the Checkerboard estate, mulled over it for a year and eventually bought it." "It needed everything — there were no roads to it, no water and no electricity. We have spent a fortune — in excess of $25 million, but we’ve essentially built a small town. It was purely a pleasure building it, but it is an operating and profitable business now. Once you start producing and selling delicious wine, you have to become serious about it because your customers are serious about it. 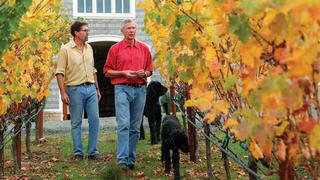 We certainly enjoyed and collected wine before, but we weren’t connoisseurs; now we tell people we are farmers." 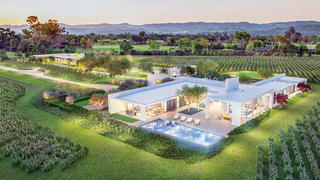 "We were searching for a country home; I was between Miami and New York and Steph was in San Francisco," says Dennis O'Neil, co-owner of the Checkerboard estate in Napa Valley (pictured). "We were looking for something in wine country in the Napa Valley area and we came across the initial part of the Checkerboard estate, mulled over it for a year and eventually bought it." "It needed everything — there were no roads to it, no water and no electricity. We have spent a fortune — in excess of $25 million, but we’ve essentially built a small town. It was purely a pleasure building it, but it is an operating and profitable business now. Once you start producing and selling delicious wine, you have to become serious about it because your customers are serious about it. We certainly enjoyed and collected wine before, but we weren’t connoisseurs; now we tell people we are farmers."